The tale of the elm (Ulmus spp.) is tinged with melancholy and, deeper in history, something sinister. A brooding, watchful tree associated with death, the elm tree has a rich and varied cultural past. Many Anglo Saxon place names derive from the elm tree, tracing its antiquity at least to the Bronze and Iron Ages. Elm’s roots run deeply through folklore, an associate of the Otherworld, symbol of both creation and death. Embla, the first human woman in Norse mythology, was created by Odin and his brothers, Vili and Ve, whose incantations roused a fallen elm tree into life. In Celtic mythology, the elm tree is associated with the Underworld, and with elves and faeries, who dwell in their stretching boughs. Elms were said to grow close to passageways that lead out of our Earthly realm, and into Faerie or the Underworld. ‘Elm hateth man, and waiteth,’ a chilling old saying goes, referring to the trees’ deadly habit of dropping boughs without warning. Superstitions of felling or damaging elm grew from this, and misfortune was believed to befall those who cut them down. Elm wood is strong, flexible and known for its resistance to splitting and decay, lasting well in wet conditions and it has been used historically for the building of groynes, boats, wheel covers and coffins. Early water pipes were made from elm wood, and in 1930 elm water pipes were uncovered in London that had been in use since 1613. Wych, from wych elm, is an ancient word referring to pliability, a quality making it ideal wood for building bows. Gerald of Wales, a 13th century Anglo-Norman nobleman who wrote extensively on Welsh customs, noted that the archers of South Wales favoured elm for their bows. The crude bows, poor for long range shooting, inflicted brutal injuries at close range, an advantage in the sprawling, tangled wildwood of ancient Wales. Elm was once a common hedgerow tree. Tall and narrow crowned, with sprawling foliage and dark bark divided by fissures, some species flower in spring, followed by winged fruits that fall in July. Elm can grow to giant proportions, brushing the sky at 120ft, making excellent landmark and boundary trees. Elm became a favourite in Britain in the 17ᵗʰ and 18ᵗʰ centuries, causing propagators to breed from favoured elms, taking the suckers from around selected trees and cloning them. Their genetic similarity played a deadly part when Dutch elm disease ravaged the species throughout the 20ᵗʰ century. Beginning with a yellowing of the leaves, eventually creeping terminally through the whole tree, the disease is caused by a strain of sac fungi, spread by the elm bark beetle. 90% of British native elms withered and died. Billowing park trees sank into the grass, gaping gaps appeared in hedgerows and ancient trees of old May Day ritual would never again host dances beneath their rustling boughs, a sore loss for our landscape. White-letter hairstreak and tortoiseshell butterflies have suffered along with the elm’s decline. The tree was the main food supply of their larvae, and their numbers diminished as elm died out. Dutch elm disease is not a new one, and despite the last bout being the worst on record, elm has always crept back into our woods, hedgerows and fields. 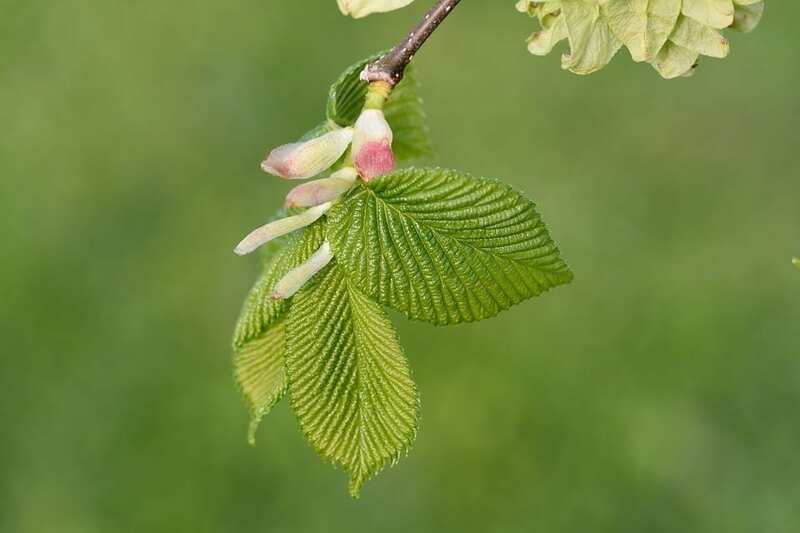 Pollen records show that elm trees have suddenly declined frequently throughout history and have always recovered, suggesting that, though fragile, if planted and protected, there is every hope that elm will flourish once more in the Wildwood.